In Mesa, our bountiful harvest is one that we proudly share with our visitors all year long. Here, fresh experiences and a treasured heritage of family farms and long-standing festivals make for lasting memories. The area has long served as a culinary gateway to Greater Phoenix with the neighboring farms and agritourism attractions providing a continuous bounty of seasonal goods for visitors to enjoy. Now, visitors can hop in their car and take a road trip filled with delights and culinary education. A dozen popular food-driven experiences line the Fresh Foodie Trail® that winds visitors through Mesa and beyond into our regional Southeast Valley towns. Experience charm and serene landscapes as you head south and east on a quest for the freshest food you can find – all from Arizona. BOOK YOUR EXCLUSIVE GUIDED TOUR NOW! A new tour has been developed exclusively with DETOURS American West tour company. The Tour starts in the morning and includes tastings, private tours at each stop and lunch, then returning you to your starting point in the early afternoon. Scheduled departure days are Tuesday & Saturdays, alternate dates can be scheduled as a group with a minimum participation. We recommend calling ahead for updated hours of operation, event schedules and more. Some attractions require admission fees. of the harvest at The Orange Patch, where you can taste, shop and tour the farm stand while taking in the fragrant orange blossoms each winter. Seasonal operation (November - March), tours available by request only. This 5,000-square-foot vertical urban farm is a center of education, sharing knowledge on how to produce healthy and nutritious food using no soil. 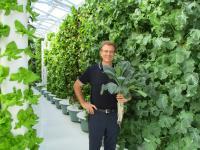 Visitors to True Garden can learn more about organic growing practices, nutrition, overall health wellness. Enjoy their weekly farmer’s markets featuring living produce on Wednesdays and Saturdays from 8am-Noon. Call ahead for a list of current events and educational seminars. Private tours available for groups of 10 or more. Tours are aimed at demonstrating the daily life on a working “agritourist” family farm. In addition to learning about modern dairy operation and how farmers work to be environmentally conscious, guests also discover the dedication given to the care and comfort of every healthy animal. Also on site is a petting zoo, Milk & Ice Cream Bar, and Mooster’s Moo-tique – a fully-stocked boutique with candy, fresh eggs, cheeses, and local jams and honey. corn, a pumpkin patch and amusements for the kids. Other events include the Easter-Eggsperience hunt with more than 8,000 “eggs (Spring), peach picking season (May), and more. Call ahead for dates and hours of operation. Located at Eastmark, Steadfast Farm is Mesa’s newest addition to the Fresh Foodie Trail®. This two-acre bio-intensive market farm grows fruits, vegetables and flowers, and raises pastured poultry for eggs yearround. The farm prides itself in focusing on honest organic farming practices. Steadfast Farm has been featured as a destination for Outstanding in the Field and their produce and flowers can be found at area farmers markets and local restaurants. Call for a list of community events and gatherings at the farm. 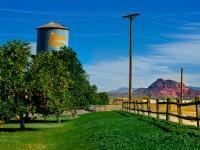 B&B Citrus Farms is one of Mesa’s original groves that dates back to 1915. Generations of Mesa visitors have made a stop here part of their travels to load up on local citrus and to ship cases of fruit back to friends and family in colder climates. Hungry diners also time their visit to a meal and cross the parking lot to enjoy Jalapeño Bucks! This BBQ-meets-Southwest roadside diner with spacious outdoor seating packs them in and people come from all over to fill up on brisket and pulled pork. The flavor profiles here are rich and tasty and can best be described as ‘new wave Mexican soul food’. Discover homemade ‘secret recipe’ sauces, the best burritos in the West, fresh salsas, baked beans and all the trimmings. Arizona’s only family-owned and operated working olive mill and farm, where olives are grown and pressed for the production of high quality extra virgin olive oil. Experience their Olive Oil 101 class (offered hourly) and enjoy complimentary tastings of oils, olives, vinegars and more. Visitors are invited to dine at the Mill’s Tuscan-inspired eatery featuring fresh gourmet sandwiches, soups, salads, gelato and fresh roasted espresso from Superstition Coffee. Relax in the olive grove at “The Pit,” which features specialties from the grill and local craft brews. See website for special event listings and hours of operation. This fourth-generation working family farm hosts seasonal events year-round including the Pumpkin & Chili Party (October), the Peach Blossom Festival (February) and peach picking season (May), to name a few. Visitors can enjoy the organic U-PICK garden with a selection of produce that changes by the season. Guests can make reservations to stay overnight at The Cozy Peach, the farm’s onsite glamping experience. The plush, newlyrestored vintage trailers include Airstreams, a Spartan Manor and Spartan Mansion, Silver Streak, a vintage Pullman Train and more. Be sure to stop at the farm bakery and indulge in fresh baked caramel apple pecan pies and cinnamon rolls and shop for local goods. Call ahead for hours of operation. Taste Arizona history at this family-owned flour mill focused on growing hand-cultivated, heritage grains with minimal processing. 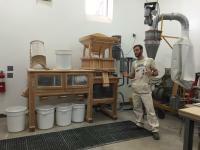 Hayden Flour Mills in Queen Creek offers a full-sensory culinary experience that starts with a tour of their milling operation. The surrounding fields at Sossaman Farms have been growing wheat for more than 100 years. Learn about this flavorful grain and its importance to the American diet as it is used in everything from artisan breads, pasta and wheat berries to bourbon, craft brews, grainbased oils and more. Retail inside. Call ahead for advance tour reservations and hours of operation. Joe’s Farm Grill is a ‘60s-era modern-day diner that was converted from the Johnston Family homestead. Featured on Food Network’s Diners, Drive-Ins and Dives, the menu showcases classic American fare with farm fresh ingredients. 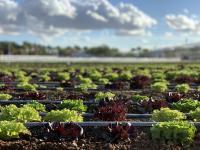 Located in Agritopia, this certified organic "urban farm" was designed to flourish in the urban setting and was named the country’s leading ‘agri-hood’ by New York Times. The same-day harvest is also sold at Farmer&apos;s Market at Agritopia Wednesday evenings (seasonally). Guests can also enjoy The Coffee Shop and Barnone, a craftsman community featuring Garage-East micro-winery, 12 West Brewing, restaurants, retail and more. The Windmill Winery offers a unique special event setting just outside the Mesa metropolitan area. Located in historic Florence, Arizona, you’ll find the authenticity of a rural farm combined with an elegant and rustic Wine Tasting Room. Lush landscaping and stone pathways surround the property to create a charming stay. Open to the public Wednesday through Saturday. Every Thursday, The Windmill Winery hosts food trucks and live music. Visit their website for more details and hours of operation. A seasonal guide to specialty crops available for u-pick and purchase at local farm stands and farmer’s markets throughout Mesa City Limitless®. or download a printable version of our Endless Itinerary, focusing on Mesa&apos;s Culinary and Agritourism experiences.